You can delete a list without deleting its contacts, delete all contacts in a list, or delete individual contacts. Please note: only the contact's timeline activity will be deleted. If the contact has an associated company, deal, or ticket, the associated object's timeline activity (e.g., calls and emails) will not be affected as they are explicitly associated with that object. Deleted contacts will be removed from counts in the reports. Visits from deleted contacts will appear in the sources report, but removed from the count of contacts. Deleted contacts generated by a campaign will no longer appear in the campaign dashboard. Deleted contacts will remain in the form submissions and landing page submissions reports, but will appear as No Contact. Hover over a list and click the More dropdown menu, then select Delete. 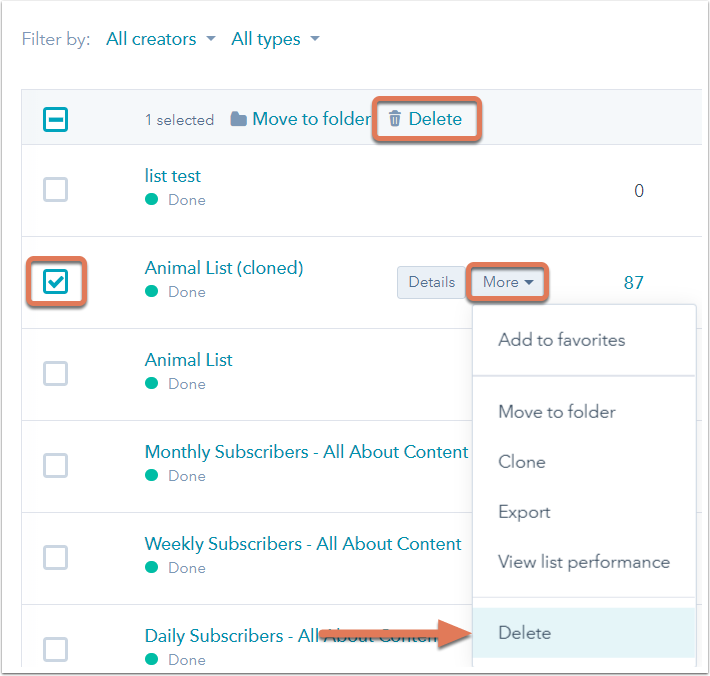 To bulk delete lists, select the checkboxes next to the lists to delete and click Delete in the table header. In the dialog box, click Delete to confirm your deletion. Please note: consider the data lost when deleting a contact prior to doing any deletions. To choose specific contacts, select the checkbox next to each contact to be deleted. To select all contacts in the current page of the list, click the checkbox in the table header. To select all contacts in the list, select the checkbox in the table header. At the top of the table, click Select all x contacts. Click the More dropdown menu and select Permanently delete. This will delete the contacts from HubSpot. In the dialog box, confirm your deletion by entering the number of contacts to delete, then clicking Delete. Click the name of the contact to delete. In the left panel, click the Actions dropdown menu and select Delete. Select the checkbox next to the contact(s) to delete. At the top of the table, click Permanently delete.